Outdoor walls of Alexandria are full of writings. Stencil graffiti, sprayed messages, painted advertisements, ball-pen notes, stickers and billboards create a mostly anonymous conversation of different messages struggling for space, mostly transient and at times poetic. Especially political graffiti during and after the 2011 revolution became the site of an often uncivil debate made up of deletions, crossings-out and changes to graffiti by others. But also love messages, religious phrases and advertisement have important messages to tell. The writings on the cityʼs three-dimensional walls often mingle with the metaphorical walls of social media feeds as inhabitants of the city are engaged in poetic, transient conversations and commentary on their phones while they move through their city. Sometimes the different poetics and materialities of wall-writing also converge when social media mimes reproduce or simulate photos of graffiti. In Alexandria today, both ways to write on walls are common and productive of spaces and social relations in the city. These forms of everyday textual conversation and presence push the limits of conventional understandings of literary vs. ordinary language. They also tell important stories of the coexistence of different visions and ways of life in a plural but not pluralistic city. Les murs extérieurs d’Alexandrie sont remplis d’écritures. Graffitis au pochoir, messages à la bombe aérosol, annonces peintes, notes au stylo-bille, autocollants et panneaux créent une conversation anonyme composée de différents messages rivalisant pour l’espace, messages en général éphémères et parfois poétiques. Les graffitis politiques en particulier, sont devenus pendant et après la révolution de 2011, le lieu d’un débat souvent incorrect avec des graffitis supprimés, biffés ou modifiés par d’autres. Mais les messages d’amour, les phrases religieuses et les annonces ont d’importantes choses à dire. Les écritures sur les murs tridimensionnels de la ville se mêlent souvent avec les murs métaphoriques des médias sociaux alimentés par les commentaires ou les conversations poétiques et éphémères des habitants qui se déplacent à travers leur ville. Parfois, les différentes poétiques et matérialités des écritures murales convergent quand les médias sociaux font mine de reproduire ou d’imiter des photos de graffitis. Aujourd’hui, à Alexandrie, les deux manières d’écrire sur les murs sont répandues, produisant des espaces et des relations sociales dans la ville. Ces formes de présence et de conversation textuelles quotidiennes repoussent les limites d’une interprétation classique opposant langage littéraire et langage courant. Elles disent aussi des histoires importantes de coexistence entre différentes visions et façons de vivre dans une ville plurielle, mais non pluraliste. 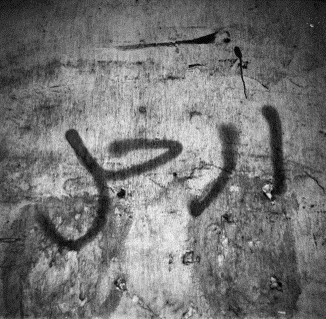 In 2011, a single word could be found on walls all over Alexandria: Leave (see figure 1). When it was sprayed in January or February 2011, there was no need to say who the addressee was. That much was clear, and the message was everywhere. Kom El-Dikka, Alexandria, November 2011. Samuli Schielke is a social and cultural anthropologist. Born in Helsinki, Finland, in 1972, he received his PhD in Social Sciences from the University of Amsterdam in 2006. He is currently a research fellow at the Zentrum Moderner Orient in Berlin. His ongoing ethnographic research in Egypt touches on topics of religion and morality, aspiration and frustration, migration and imagination, conventional understandings revolutionary politics and literary lives, class, and social mobility. He is the author or editor of the books You’ll Be Late for the Revolution (in Arabic, 2011), The Perils of Joy (2012), Ordinary Lives and Grand Schemes (with Liza Debevec, 2012), The Global Horizon (with Knut Graw, 2012), In Search of Europe? (with Daniela Swarowsky and Andrea Heister, 2013), Egypt in the Future Tense (2015), and Until the End of Oil (in Arabic, 2017). He has co-directed three films: Messages from Paradise #1 (2009) with Daniela Swarowsky, The Other Side (2010), and The Secret Capital (2013) with Mukhtar Shehata.